I love it when I stumble upon things peacefully tucked away in the middle of all the chaos of normal everyday. On Sunday afternoons, my husband and I like to take long bike rides – taking the time to explore and find things new. We never have a set route, we just point our bikes and ride. 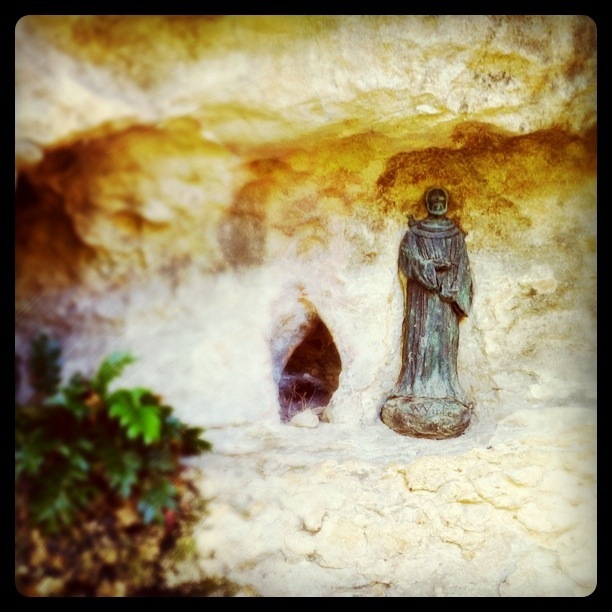 On this particular Sunday, we were cruising down around the Hike and Bike Trail along the Shoal Creek corridor when we came across this Saint, tucked away on an overhang. In this particular spot, a spring is flowing and the greens are brightly green. The scenery is beckoning you to take a moment to stop and reflect, to take in the tranquility found in the middle of the chaos of your everyday. ← Who’d Stop at 30… Shoes?